Line a baking sheet with foil and place the eggplant under the broiler, rotating every 5 minutes so that every side of the eggplant is evenly charred. After the eggplant is charred, turn the oven temperature to 500°F and roast for about 15-20 minutes. Let cool and cover with plastic wrap. Place in the fridge for 3 hours or overnight; this will help permeate the smoky flavor in the eggplant. Three hours later or the next day, use a pairing knife to peel the charred skin off the eggplant, then place the skinned eggplant and remaining liquid in a food processor bowl. Add in the tahini, yogurt, chickpeas, lemon zest and juice, garlic, chili flakes, a drizzle of EVOO, salt and pepper and puree until smooth. Add in the parsley and mint and pulse until blended, about 15 seconds. Serve with pita chips and sliced cucumbers alongside. In Recipes-list.com we have selected the most viewed recipes from category - uncategorized . Enjoy the best recipes specially selected for you! 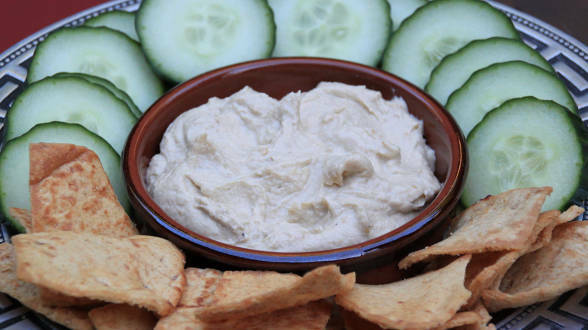 Smoked Eggplant Hummus is the right choice that will satisfy all your claims.